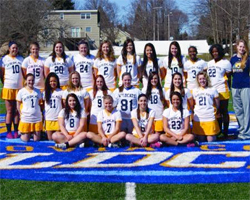 The Cazenovia women's lacrosse team defeated the Wildcats of SUNYIT by a score of 16-8 on Tuesday in the teams' first round NEAC tournament matchup. Cazenovia defeated SUNYIT just eleven days prior, escaping with a 13-12 victory. With the win the Wildcats advance to this weekend's quarterfinals as they take on the host and top seeded Storm of Keuka College at 11:30 am this Saturday May 3. Read the complete game recap on the Wildcats Athletics website.